The teaser for Superman Returns, which hits theaters next summer, is out. You can see it here.) I’ve watched it half a dozen times now, and it still gives me goosebumps. For the informed, Superman Returns is being directed by Bryan Singer, one of the most talented young directors in Hollywood right now. His credits include the recent X-Men movies as well as The Usual Suspects, which is one of those lots-of-plot-twists character pieces that I enjoyed immensely but, because of the violence and profanity, can only watch once. 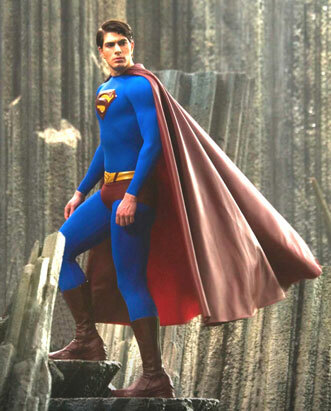 Superman Returns also has an unknown actor in the lead, one Brandon Routh (rhymes with south), who looks so much like Christopher Reeves in some of the publicity photos that it’s a little eerie. As for the story, suffice it to say that Superman has been away from Earth for a few years, and when he returns, he finds Lois Lane with a child and engaged to be married. Plus Lex Luthor has some diabolical plan, I’m sure. Oh, and I think there are aliens involved. Anyway, it’s a departure from the previous Superman films, which is good considering the third one co-starred (wince) Richard Pryor and the fourth one was about nuclear arms proliferation. Ugh. So the new Superman movie will be different in some ways. But not in all ways. As the teaser suggests, there is some elements of the last few pictures that will carry over to this one. And it’s here where Singer shows his genius. John William’s score from the first Superman movie is arguably one of the best film scores ever composed. It’s certainly one of the most memorable. Luke, who’s only seen about five minutes of the first Superman movie can hum some of the tune. That’s how catchy it is. I love the score. It’s nostalgic. It conjures up all these great memories that I associate with the wonder and magic of Superman. And that’s because it SOUNDS like Superman. It’s majestic and powerful and suspenseful and everything that is the man in tights. Marlon Brando, who played Jor El, Superman’s Kryptonian father in the first Superman movie, is back as well. But how can that be, you ask? Brando has been dead for, what, a few years now? The answer is simple. When filming the original Superman, Brando recorded a lot of voice over for the film, much of which wasn’t used. So Singer has mined these recordings and plugged a few of them into the new movie. But this is where the trailer trips up a bit. There was a REASON why these recordings weren’t used. They’re condescending. In the trailer, Brando (Jor El) explains why he sent Kal El (Superman), his only son, to Earth. And it’s a little insulting. According to Jor El, we earthlings “lack the light” needed to live peacefully. And we have a “capacity for good,” but without Superman to guide us, we’re lost sheep. The “Superman as Savior” angle works only to so many degrees. And this is overkill. Perhaps you think that harsh criticism. After all, Singer and his writers didn’t pen the voice over. They’re just using what was available. But the point is they used it. They didn’t have to. They chose to. Superman is a hero. He saves people from danger and stands for truth and justice. But he doesn’t teach us what good is. We know what good is. That’s why we admire him. He’s a superhero, not a God. This isn’t to say I don’t have high hopes for Superman Returns. Quite the contrary. It looks amazing. The footage for the trailer is stunning. I particularly enjoyed one over-head shot of citizens of Metropolis all frozen in wonder, staring up into the sky at, what we can assume is, Superman. In fact, I felt the same way about the trailer: I stared in wonder. This is going to be good, folks. I’ll forgive Brando and the original writers for their touch of overkill. 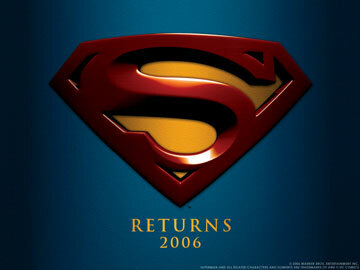 As far as I’m concerned, Superman Returns is THE movie of 2006.